I've always loved the iconic L. & J. G. Stickley No. 220 Prairie Sofa. As the pair of sofa and love seat in our own living room have aged, and as my skills as a furniture maker has increased, I knew this day would come. This is going to be large build, as it is two pieces of large furniture that I'll be building at the same time. Space in the shop is going to get tight. Although these are once again reproductions, I'll make changes where it suits me. The first obvious change is that Stickley never originally produced a love seat version of the sofa. The love seat is a more modern type of furniture. The modern Stickley company still sells the sofa today, and has made a love seat version as well. Generally, this build is pretty straight forward; three frame and panel sides, a front stretcher, seat frames, and then upholstery. There is also an alternate variation in the construction of the piece; instead of frame-and-panel for the sides, another popular variation is one that uses lots of little vertical slats, or square spindles, in place of the panels. I am still considering this option. This is the first piece(s) that I'll be working with an upholsterer on, and I'm pleased to have found a great local shop to work with on that. The pieces can be upholstered with either leather, or fabric, but I'm leaning towards leather. The materials are going to be classic quarter sawn white oak; an old friend of mine by now. And speaking of old friends, I'm thrilled at how the material part of this is going. An old friend of mine, and fellow woodworker, David, works for the University of Chicago, and is involved with their urban lumber reclamation processes. Basically, when a tree on the universities property needs to be taken down, instead of being chipped, he helps make sure it is harvested for lumber. For the harvesting and, milling, and drying part, he works with one of my favorite local lumber suppliers, Horigan Urban Forest Products. 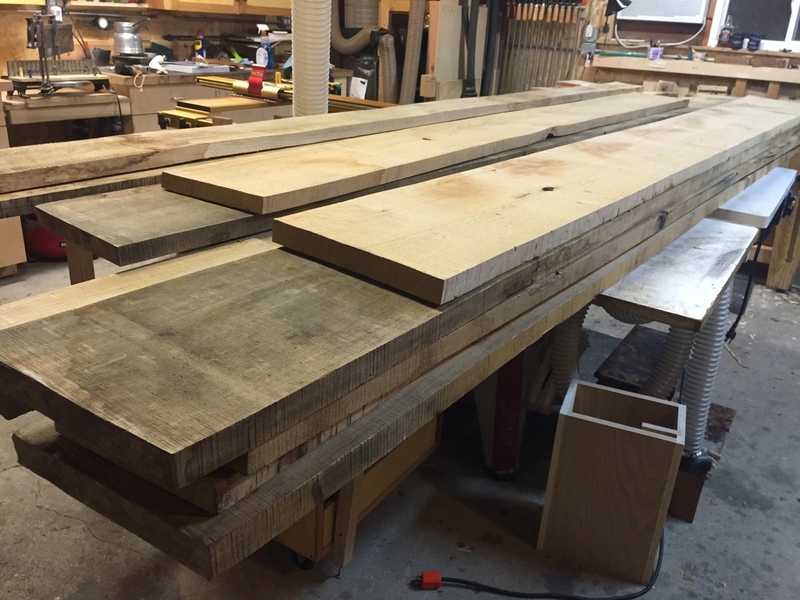 When I was looking for the lumber for this build, David let me know that they were selling a lot of quarter sawn white oak they had on hand from a tree that had been harvested and milled in the summer of 2013. The price was right, so I jumped at the chance. David even had photos of the tree being removed. Thank you David, the U of C, and Horigan UFP! 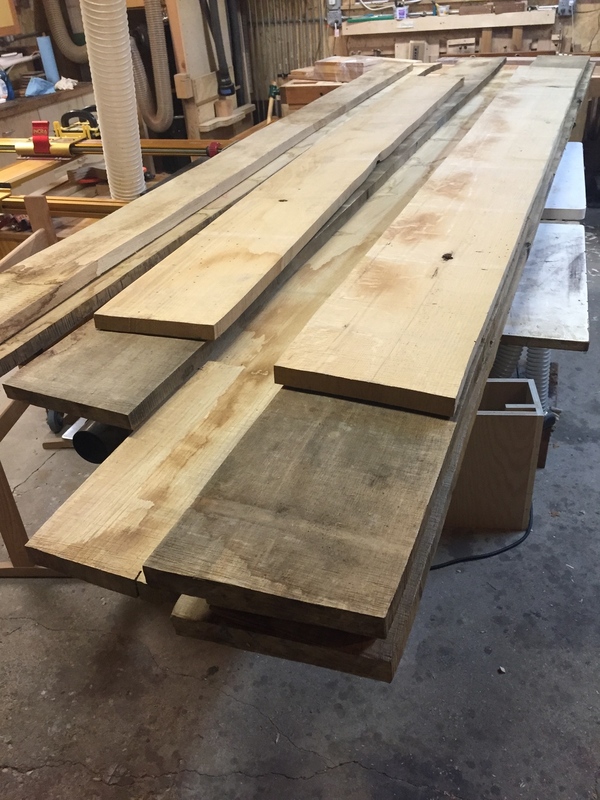 I picked up about 100 board feet of these great planks this week (with the help of another fellow woodworker, Brett), and they're now filling up the shop, ready to start the rough milling process. I'm excited about this on so many levels; excited for the end product, and the chance to work with others on making this a reality.